Château Monbrison originally formed half of Château Desmirail in the nineteenth century before coming into the hands of Monsieur de Monbrison, after whom the Château is obviously named. In 1922 Robert Meacham Davis bought the property and his children and grand children are the present owners. Laurent Vonderheyden has managed the estate for the past fifteen years. 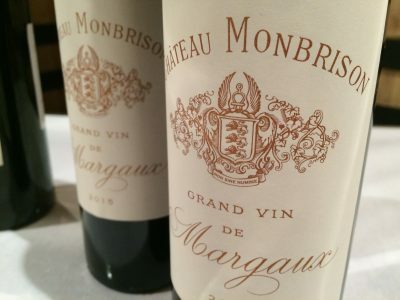 For me this is lovely Margaux wine at an affordable price. It relies on elegance, perfume and pure fruit rather than extraction. The 2009, like a great many of the appellations wines, is a great success here. It is also great value too. Vineyard/Soil: 13 hectares planted with 50% Cabernet Sauvignon, 15% Cabernet Franc, 30% Merlot and 5% Petit Verdot on gravel soils. Winemaking/Elevage: Fermentation in enamel lines stainless steel vats with temperature control, fermented warm at 32-33C, followed by long cuvasion [maceration] and then barrel aged in up to 50% new oak in the best years.